Polish composer and pianist Frédéric Chopin combined a gift for melody, adventurous harmonies, innate and creative understanding of formal design, and virtuosic piano technique to create an enormous body of piano works. He wrote his first nine mazurkas in Vienna and personally released them for publication under the opus numbers 6 and 7. Through these works the genre of mazurka was clearly defined. As a youth Chopin spent time in the countryside of Poland where he heard rural bagpipes accompany the rustic triple-meter mazurka with its strong accents on the normally weak second or third beat. The Op. 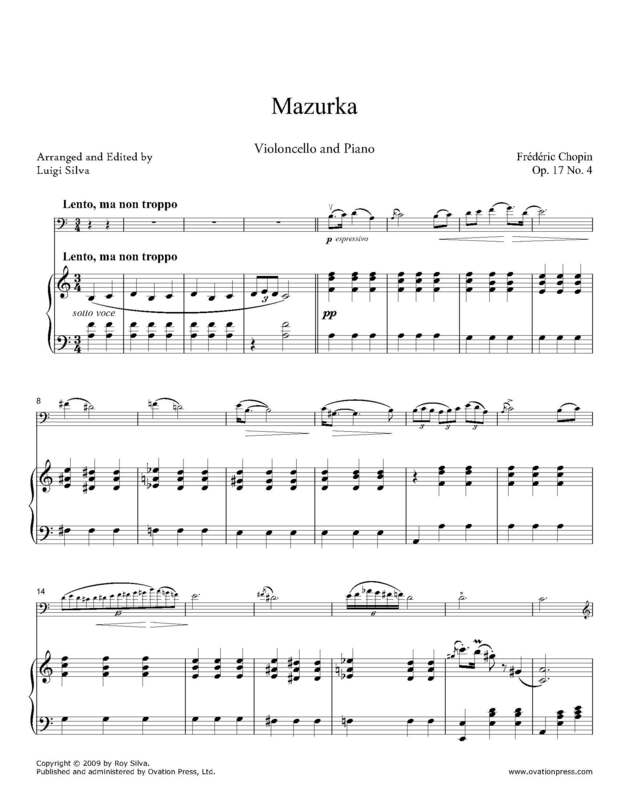 17 Mazurkas were composed in 1833 while traveling in Leipzig, Paris, and London and were premiered in 1834 with a dedication to Lina Freppa. This version has been arranged for violoncello and piano by Luigi Silva.